Recently, while visiting my wife’s parents in Rockford, Illinois, we had a wonderful tour of the Laurent House. Because my father-in-law has difficulty walking, we requested a wheelchair. 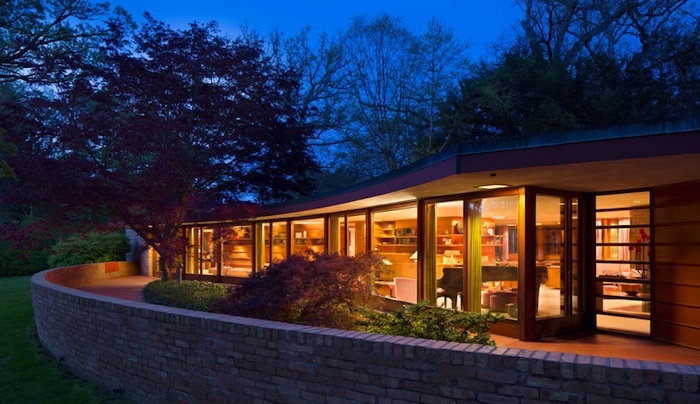 This worked out well, since this beautiful Usonian is the only home that Frank Lloyd Wright designed for a person with a disability. From carport to patio, it’s all level, no steps. Halls and doorways are wide. Light switches are reachable. The ceiling is low, as are the seats, so the man in the wheelchair is the tallest in the room. Kenneth Laurent was not a wealthy man. When he first wrote to Frank Lloyd Wright in 1948, he was a 29 year-old disabled veteran, living in hospital, in need of a home in which he could function. The architect responded with a “little gem” that made Ken feel like a king in his castle. He and his wife Phyllis lived there for the next 60 years. Every day I would come out of my bedroom and stop outside the bedroom door. Looking down the hallway and the 60 foot long wall, it made me forget about my disability and focus on my capability. The Laurent House is an exercise in organic simplicity and inspiration architecture, a tiny home that makes a big impact. If you get the chance, visit. Be sure to peer through the horizontal windows in the bedroom. Standing, you see the busy road, but take a seat, and see the world from Ken’s perspective: nothing but green trees and blue sky. I’ll be in Zürich. Where will you be on World IA Day? Thanks to my friend Noriyo, Intertwingled is available in Japanese.